Directing Change, a video contest by Each Mind Matters, collected over 1,000 California high school and college student submissions to raise awareness about suicide prevention and teen mental health. The project can teach the industry how to incorporate user generated content to promote their causes. Watch now. Johns Hopkins published a new trailer for their short documentary about normal pressure hydrocephalus. The video stars Patricia, a patient who suffered 18 frustrating months of balance, memory problems, and bladder issues with no diagnosis until she meets neurologist Abhay Moghekar. The video educates viewers on the condition while promoting the Johns Hopkins Cerebral Fluid Center. Watch now. The Centers for Disease Control and Prevention published a series of one-minute videos that promote and advocate HIV testing and prevention. Subjects share personal anecdotes about how HIV has affected their lives and why they are active in the community. Watch now. Firefighter Patrick Hardison was left disfigured after saving a woman from a fire. After living for 14 years “without a face,” Hardison was given a new life when the medical staff performed a 26 hour face transplant on him. The story, which made headlines across the US, is chronicled with exclusive behind the scenes content. Watch now. Eli Lilly and Company added a new video to their “Patient Film Project.” The video stars Ann, a former competitive speed skater, who was diagnosed with rheumatoid arthritis in her 40’s. The video focuses on her relationship with her husband and her journey to a treatment plan. Watch now. 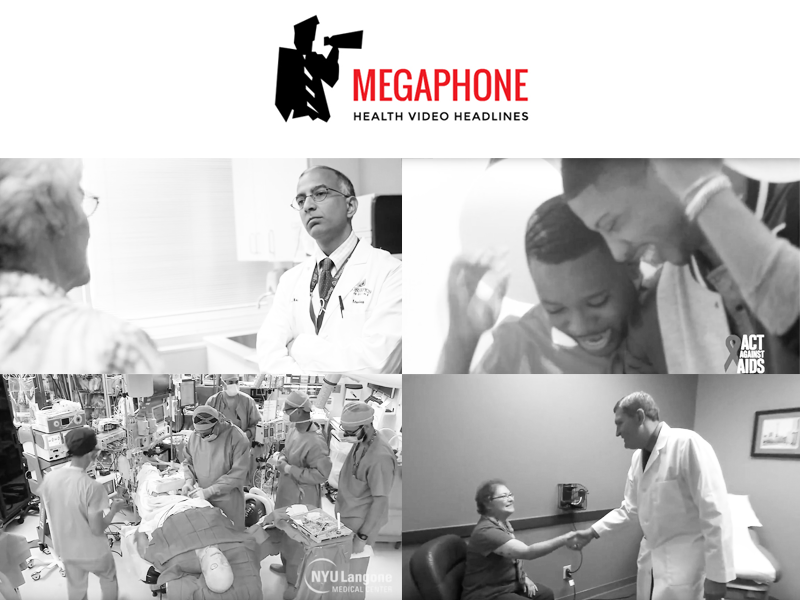 For this week’s edition of Megaphone, the editorial staff is featuring our three favorite videos from the Megaphone headlines. Check out our three favorite uses of video in the medical field. Why We Chose This Video: Sanofi and Regeneron took a bold step in health video production when they commissioned Academy Award winner Cynthia Wade to direct this powerful documentary about people living with High LDL Cholesterol. The documentary chronicles 19 stories from all over the globe. Ambitiously, the documentary meshes all the languages into the one production, giving it a unique sense of authenticity. Why We Chose This Video: NewYork-Presbyterian released this video in July 2015. The video featured hospital and staff lip-syncing to “Ten Feet Tall.” The hospital took a creative way in showing audiences that “great things are happening here” by physically showing the children dancing and laughing. It was a creative way to promote and showcase the positive results from the children’s hospital in New York City. Why We Chose This Video: This micro-documenatary follows a patient living with heart failure. In less than five minutes the video delivers important messages about the condition, treatments, and hope. The video serves as a testament to the power of short, focused pieces to create awareness. Why We Chose This Video: Dramatic Health has accomplished a lot in 2015. And they’re just getting started.